The defeat of Eonia ushered in an era of peace, paving the way for the discovery of a gateway to NEUE, a previously unknown galaxy. With no more intergalactic threats to fight, the original Angel Troupe has disbanded, and the former Angels are helping to forge an alliance with their new neighbors. As luck would have it, the gateway can only be controlled by Milfeulle, who must remain trapped until a replacement can be found. Admiral Takuto Meyers has mobilized the newly formed Rune Angel Troupe to save his bride, but are these rookies up to the challenge? 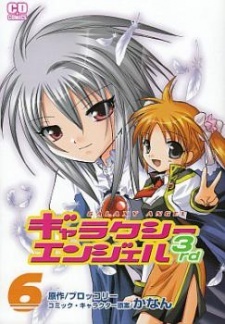 Galaxy Angel 3rd had four volumes published in English as Galaxy Angel II by Broccoli Books from January 1, 2007 to July 10, 2008 before the publisher went defunct.